Daft question, but should the buttons in the central console ie the ones round the gear stick (sports exhaust, auto stop/start, rear spoiler etc) as well as the buttons for the PCM ie tuner, media, phone, nav etc be backlit at night time? The switches on the both doors for the windows are backlit. 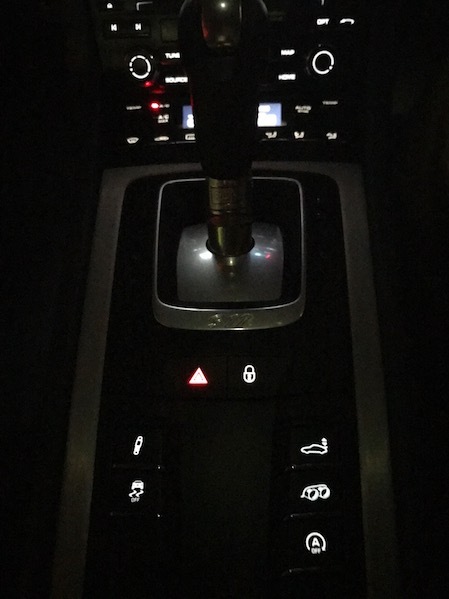 Certainly on my BMW, every single button is backlit at nighttime. Yes, backlit on my 991.1 and on a loan Cayenne I had out a short while ago. I have just found out that the button that resets the milage as well as adjusts the lights inside also regulates the button backlights. Incidentally, I was fiddling with that a few days earlier and it was after that I noticed the lack of lights. What threw me was that when I went by my OPC in between posting my query and your answers, I was categorically told that those buttons were not backlit. Haven't tried playing with it again, but will do so later. Well i've learnt something there... how does it adjust the lights? The button below the speedometer which if pressed resets the trip data, can also be twisted left/right and it adjusts the backlights in the instrument panel. If you twist left/right and look in the multifunction display, you can see the % going up/down. At the same time, it's also meant to adjust the backlights on the buttons I am having an issue with. Haven't had time to try it yet but I suspect (hope) that it'll sort it out, because as I said, I was fiddling around with that button a few days before I noticed the dark buttons. Its the dash illumination dimmer switch , you turn it side to side , the switch will brighten all switch and dash illumination , if you set it to have a dark dash board then switches will also be dark . If swithes stay dark then theres a codeing issue and OPC time . I now have the buttons lit up again - it was obviously me when I was fiddling with the dimmer switch. Yep, glad it was sorted painlessly; it was beginning to irritate me. I changed mine for first time, appears that default setting is 50%... so changed it to 51%. Half full.